Perfect family supper, great for a picnic or packed lunch, £1.50 per serving. Preheat the oven to 200ºC, gas mark 6. Heat 1 tbsp of the oil in a medium pan, add half the shredded basil and cook for 30 seconds. Add the tomatoes and simmer over a medium heat for 5 minutes, and season. While the sauce is cooking, brush the pepper and aubergine halves with the remaining oil and fry on a non-stick griddle or in a frying pan for 10 minutes, turning once, until charred and cooked through. Meanwhile, cook the pasta according to pack instructions, drain and mix with the tomato sauce. Cut the cooked pepper and aubergine into strips and stir in. Spoon into a 2 litre, oblong, ovenproof dish. Scatter over the mozzarella and remaining basil. 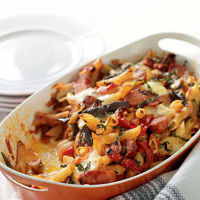 Tuck the chorizo into the top of the pasta and bake for 15 minutes until the top is golden. Serve with salad. For a veggie alternative, serve the pasta with the vegetable sauce but leave out the mozzarella and chorizo topping and the baking instead. Instead, simply scatter with the basil . If you want to prepare ahead, assemble the dish and store in the fridge. Then just bake for the final 15-20 minutes. The dish needs a red that's not too heavy but with a robust density. Try the Marquesa de la Cruz Tempranillo 2007 Campo de Borja, Spain, Bin: 780253.